I'm participating in NaNoWriMo this month and the absolutely critical tool for someone with Internet-fueled ADD like myself is a suite for distraction free writing that will isolate a writer from their busy computer environment. The traditional choice on Mac OSX has been WriteRoom, an application that will take the user into a very minimalist fullscreen writing mode. Perfect for the aspiring author. 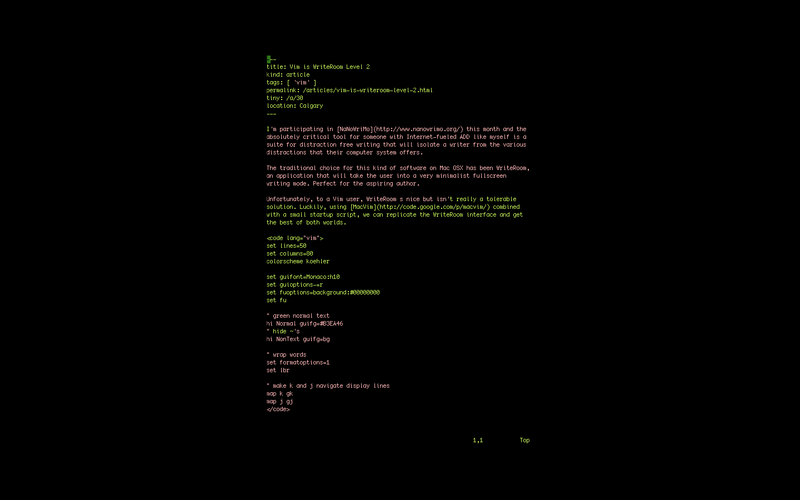 Unfortunately, to a Vim user, WriteRoom is nice, but isn't really a tolerable solution. Luckily, using MacVim combined with a small startup script, we can reproduce the WriteRoom interface and get the best of both worlds. Save this as a *.vim script (e.g. 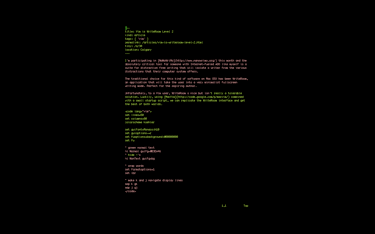 focus.vim) and source it in using MacVim's mvim command: mvim -S focus.vim <file to edit>. I personally use set an alias for it as well: alias vif='mvim -S focus.vim'. As you can see, we get an interface nearly indistinguishable from the one offered by WriteRoom, and with the full power of Vim. Outstanding!